There were hydrogen-powered cars at the ONS exhibition this year - so will we all soon be driving one? Well, not just yet - especially if you want room for bags - the gas tanks are a little on the large side. Mazda demonstrated their dual-fuel car (it has both a normal petrol tank and a hydrogen gas tank) and they filled it with hydrogen at Statoil's newly-opened hydrogen fuel station at Forus, near the Statoil headquarters offices. 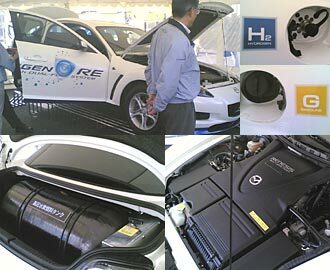 It is a Mazda RX-8 Hydrogen RE (Rotary Engine). The Wankel rotary engine is apparently better suited to Hydrogen gas fuel than the standard internal combustion (piston) engine. Several of these cars will be leased by Mazda in Norway. Statoil are also sponsoring hydrogen-powered concept cars, including FYK, made in Norway by Aetek AS. These are driven by a pre-mixed blend of hydrogen gas and natural gas, called Naturalhy. The blend can vary, but Statoil is using a blend with 8% hydrogen - and is also available at Forus, since 23 August 2006. Statkraft are involved in hydrogen production and storage systems, and will open HYTREC, a new research and demonstration centre in Trondheim in 2007, along with Statoil and Den Norske Veritas. Statkraft explained some of the issues of safety and storage volume associated with hydrogen - gas form is less dangerous but very bulky; liquid form is much more compact, but needs to be kept cold. Although there will be several "hydrogen-powered" cars of various types in Norway from now on, it will be a long time - possibly 10 to 15 years - before any of us is seriously considering buying a hydrogen car.